The colors for this challenge are green room, blueberry, persimmon, and peach bellini. I started off with the Scribble Roses set by MFT. 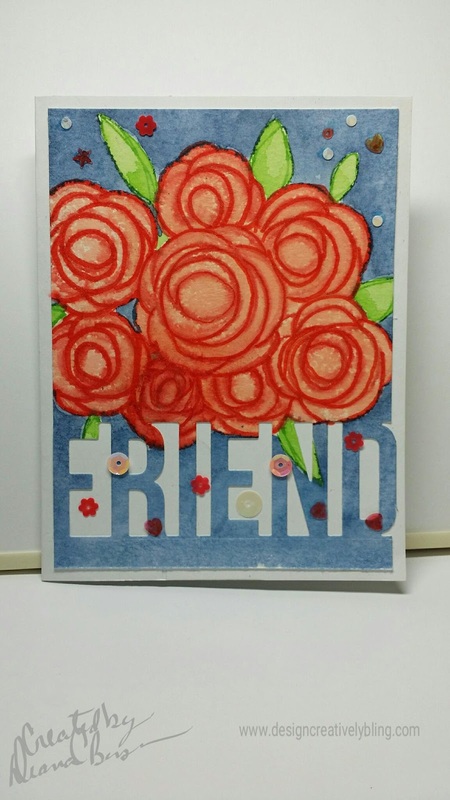 I used peach bellini as the base color and persimmon as the detail color for the roses. The leaves were stamped in green room and then I put some color on an acrylic block and water colored them. I also went back and touched up the flowers in the same manner. Taking the blueberry ink pad and smooshing it on an acrylic block and adding a few drops of water is how I made my watercolor for the background. After it was all dry I die cut it using MFT'S friend die. I adhered it to a white card base and added some Lucy's cards sequins. Peach roses are my favorite!